This recipe is one of those that is so quick and easy, folks won’t believe it. Since it uses canned tomatoes, it’s great when fresh tomatoes aren’t in season. But it’s so good and so easy, I bet you’ll be making it any time of the year. 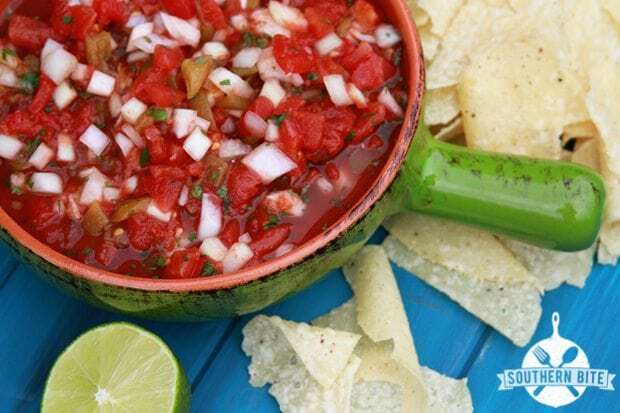 If you like spicy salsa you can even add in some chopped jalapenos. For an even easier version, toss the ingredients in a blender and switch it on. The result is, of course, a much smoother salsa but it keeps you from doing all that chopping. 🙂 Y’all enjoy! Combine the ingredients in a medium-sized bowl. Refrigerate to allow the flavors to develop. Pop the ingredients in a blender and blend until your desired consistency. This recipe is featured over on FaveSouthernRecipes.com! 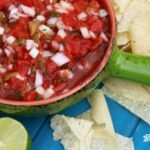 I love an easy homemade salsa. Looks great!